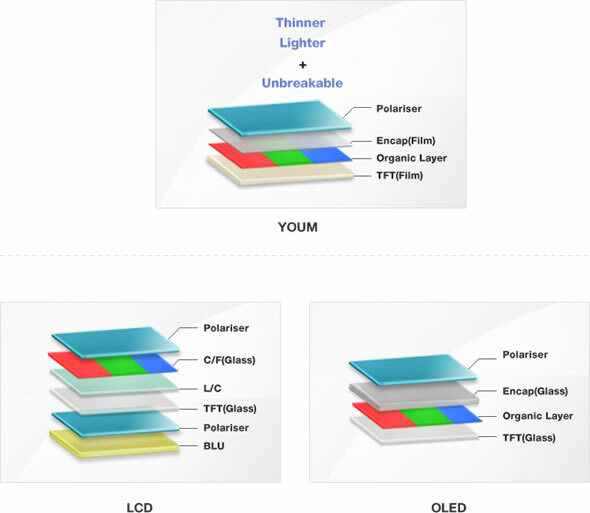 This isn’t the first flexible display technology we’ve seen and Samsung has been toying with flexible panels for a while, but the company is said to now be ready to mass produce the panels with a probable 2012 release. Now as far as applications go you can put your imagination at work as the possibilities are endless. The screens can wrap around curvy gadgets and take all kinds of different shapes. We are also imagining foldable tablets or even ‘tube-form’ tablets where you pull the display out of the enclosure. The key is that now manufacturers could pretty much integrate a display into anything.